If you have invested a lot of time, effort and maybe even money in the linkage of your Internet presence, the Backlink Checker Software Tool helps you regularly examine whether agreed links actually exist. Though trust in link partners is good, monitoring them occasionally is better yet. This is why the Backlink Checker is an absolute must for all SEO, SEM and web workers who want assessments and meaningful reports to track time spent and money invested. Checks should be performed not only for a presence of backlinks; it is also a good idea to ascertain whether the set links are "follow links" and whether the linked pages might be ignored by spiders on the basis of entries in the "robots.txt" file. Those who attempt to verify the existence and quality of backlinks manually are soon daunted by the sheer effort this entails. However, those who consequently decide to stop checking backlinks are being irresponsible and may well be throwing their money out the window. The Backlinkchecker software is no longer developed and is therefore no longer offered for sale. The download link has been removed. If you are a existing customers who want to download the software please proceed as follows: Contact us using the contact form or our support email address. Include your invoice number or reference number or customer number. The KS-SW Backlink Checker is a PC software which makes it possible to assess, monitor as well as document the presence and quality of links to your website. checks for the existence of set links on partner websites. determines the number of internal links on partner websites. determines the number of external links on partner websites. indicates a link's anchor text. checks whether a follow-up attribute has been set for a "robots" meta-tag. checks whether a no-follow attribute has been set for a link. checks whether a "disallow" attribute has been set for a partner website in the Robots.txt file. indicates the size of the partner website. indicates the server code of the partner website. indicates the server header of the partner website. optionally allows entry of a comment for each partner link for the purpose of documentation. optionally allows allocation of a link list for checking whether a partner link is present in the list. allows up to 2000 links per project. 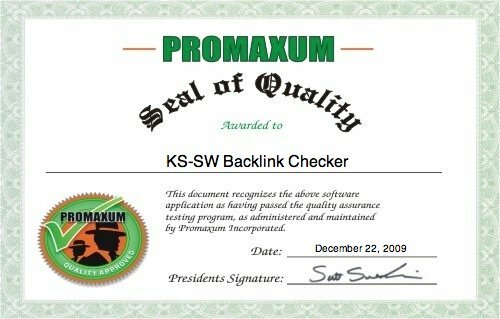 This certificate confirms that the KS-SW Backlink Checker has passed the Promaxum Seal of Quality review process. Receiving this certificate shows that this program has adhered to the highest possible standards set forth by the Promaxum review staff. A backlink is an incoming link to a website or web page. Many search engines use backlink count as an indicator of a website's link popularity and importance, one such example being Google's page rank algorithm. "Link" in this context is short for "hyperlink" which is a reference made in a document to another location within that document or within a different one. Hyperlinks effectively weave the entire World Wide Web together. A website is an Internet domain comprising linked documents. Alternative terms for website include web presence and web offer. A website which sets a link to another website increases the latter's link popularity and visitor count. In return, the website referred to by the link usually also sets a link to the invoking website (partnership). Create quick & easy a custom made Frontend Menu for CD,DVD,USB.